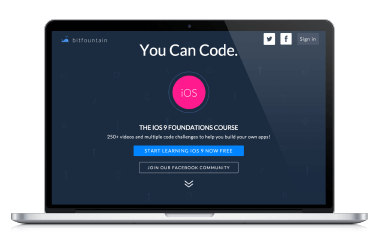 Bitfountain came from humble beginnings to become the premier mobile development training platform on the internet–scaling from nearly nothing to $2m in less than 2 years. 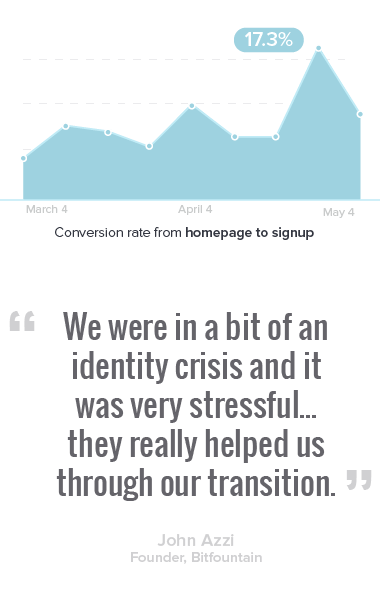 Their growth was the result of creating amazing educational content and then leveraging affiliate promotions to quickly scale their user base. Building content, engaging with students, and bootstrapping the platform created Bitfountain’s success, but it left very little time to reflect on what was working and what was not. Essentially, the team experienced success by running fast and hard, but saw recent numbers slow month after month as their content became out of date. As a fast growing company, the Bitfountain team was accustomed to working every channel imaginable. Their scrappiness made sense in the early stages of the company. They promoted their product everywhere knowing that if it stuck just a fraction of the time, they’d be successful. As Bitfountain scaled, their limited resources (4 team members) were better spent creating new content for the platform. In addition, they didn’t have a traffic problem; they had conversion and product problems–exactly the types of problems we like to fix! 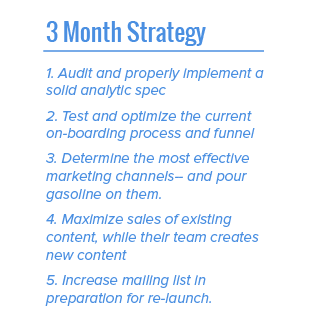 Initially, our 3 month plans for Bitfountain didn’t include a recommendation to rebuild their platform, but the deeper we dug, the more it became apparent that their current LMS was not going to scale with their business. After the first two months, we changed course and adapted our plan around the need to quickly create a custom LMS. With Bitfountain, once we analyzed the data and began implementing changes, we uncovered roadblocks that no one saw coming. Working on a monthly retainer–rather than a hard set of deliverables–allowed us to focus on driving results instead of focusing on a legal document with now out-of-date deliverables. We were able to uncover valuable data in the first two months that drove the design and launch strategy of Bitfountain’s new platform and pricing model. When we first met with the Bitfountain team, we hit it off because they didn’t want to settle for just being good–they wanted to be amazing. We were able to identify and fix the problems that were holding them back. With this clarity they are poised to be an amazing company.